Selected Science News: A LINK BETWEEN DEMENTIA, HIGH BLOOD PRESSURE AND BLOOD FLOW IN THE BRAIN? A LINK BETWEEN DEMENTIA, HIGH BLOOD PRESSURE AND BLOOD FLOW IN THE BRAIN? Blood flow through the brain is essential for the delivery of nutrients such as glucose and oxygen that are needed for nerve cells to function. During the early stages of Alzheimer's disease (AD) patients can suffer from high blood pressure and blood flow through the brain is reduced: the greater the reduction, the worse patients' dementia becomes. A new study will look at the relationship between dementia and high blood pressure, and how blood flow is regulated in the brain. The findings may help researchers identify if some drugs already used for other human conditions may be useful for the treatment of diseases such as stroke and Alzheimer's disease (AD). Academics at Bristol University's Dementia Research Group, based at Frenchay Hospital, have been awarded a grant of over £266,000 from the British Heart Foundation (BHF) to assess whether drugs that block a small naturally produced molecule called endothelin-1 can improve blood flow through the brain. In animal models of AD a reduction in blood flow occurs well before the onset of Alzheimer-like damaging changes to brain tissue. The most potent cause of the narrowing of blood vessels is a small molecule called endothelin-1 (ET-1). This molecule is produced by the action of endothelin-converting enzymes (ECEs). 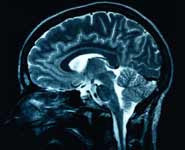 The Bristol-based academics recently found that ECE-2 in the brain of AD patients was abnormally high. One of the hallmarks of AD is the large amount of amyloid β, a toxic molecule which accumulates in the brain of AD patients. The Bristol-based researchers have shown that ECE-2 production increased when nerve cells were exposed to amyloid β, long before people start to display the memory problems recognised in AD. The academics therefore suggested that an important cause of reduced blood flow through the brain in AD (and to high blood pressure, which has been linked to AD) is likely to be an increase in ET-1, resulting from the stimulatory effect of amyloid β on ECE-2 production. Seth Love, Professor of Neuropathology, said: "We hope our study will shed light on the role of amyloid β. We know it to be involved in AD but it is produced throughout life and what it does in the normal brain has long been a mystery. "In addition, our research could have important implications for blood pressure control in people with hypertension as well as for treatment of diseases such as stroke and dementia where effective treatments remain limited. Drugs that block ET-1 are already licensed for the treatment of other human diseases and could be used to treat people who have elevated levels of amyloid β and increased ECE-2 activity, whether in the context of established AD or stroke, or at an earlier stage prior to the development of irreversible brain damage." Professor Jeremy Pearson, Associate Medical Director at the BHF, added: "Thanks to the generous donations of our supporters in Bristol we're able to fund vital research to fight diseases of the heart and circulation. This latest grant joins our portfolio of world-leading research to improve prevention, diagnosis, treatment and care of heart diseases."